The 8-cup Bonavita BV 1900TS gets raves across the board -- for performance, perfect brewing temperatures, and very simple operation. There aren't a lot of programming features, but for those who put taste as a top priority, this is a great choice. Stays in the heat sweet spot. The Bonavita BV 1900TS is a top pick of several experts, who say it spends most of its brew cycle in the ideal temperature range of 195 to 205 degrees Fahrenheit. It's certified by the Specialty Coffee Association of America (SCAA), and is one of the least expensive coffee makers to achieve that distinction. Unlike most "drip" coffee machines, which just drip a single stream of water through the filter, the BV 1900TS "showers" the grounds, then keeps them saturated for the optimal number of minutes to extract the most flavor, but is still a relatively fast performer -- finishing its job in about six or seven minutes. 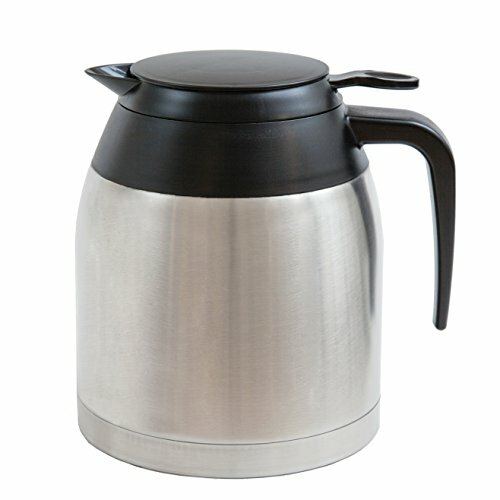 The thermal carafe keeps the coffee hot for about 2 hours. What you see is what you get. You won't find many bells and whistles on the Bonavita BV 1900TS. Like other coffee makers in the Bonavita line, it has just a simple on/off switch and a plug. However, one much-touted feature on this Bonavita is an optional pre-infusion mode that wets freshly roasted ground coffee so it can de-gas before the brewing process begins. However, most owners say they can't tell the difference between coffee that's been pre-infused and coffee that just goes through the regular brewing cycle. Others also note that the pre-infusion setting can be confusing to figure out. The carafe on the BV1900TS is fully stainless steel, and experts say this coffee maker produces results that are as good as its much pricier competitors. Carafe design isn't the best. 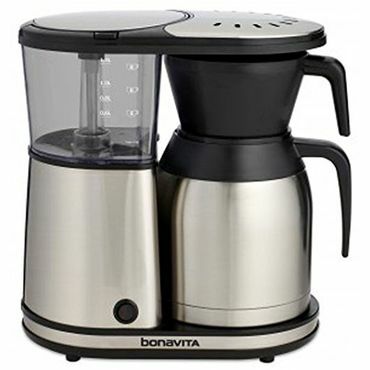 Most reviewers appreciate the simplicity of the Bonavita BV 1900TS, saying it could not be easier to use -- just prepare your coffee and turn the pot on. A few note that they particularly like the water reservoir, which is not only easy to fill, but also to read the water markings and spot where the water level is. One small quibble some reviewers have is that you have to remove the filter before you can pour from the carafe (because it sits directly on it) and replace it with a pouring lid. Others say the carafe leaks when you have the lid on it, and can't understand why there is nowhere to store the lid when not in use. It's also not the easiest carafe to clean, owners note. A smaller footprint. Compared to some other showerhead-type coffee makers, the small size of the Bonavita BV 1900TS make it ideal for situations where counter space is at a premium, or in kitchens with low-hanging cabinets. Of course the tradeoff for that is a relatively small eight-cup capacity (and that is based on rather small, 5-ounce cups) and few special features to speak of. The latter doesn't draw many complaints, but the former does. Those who frequently entertain are especially miffed that a 10-cup or larger version isn't offered. Even couples who consume lots of coffee in the morning report bumping up against this coffee machine's capacity -- though others say it's an ideal size for a single person or a less-caffeine-addicted couple. It's made from stainless steel with black accents.